figure 1-33 Regulation of receptor performance, the Kd (A), and receptor concentration via either up-regulation (B) or down-regulation (C). In A, three saturation curves for a receptor are shown; the Kd's for binding curves K, L, and M are 10~10, 10"9, and 10~8 M, respectively. If the prevailing hormone concentration bathing the target cell is 10"® M, then depending upon the affinity of the receptor for its ligand, the level of receptor occupancy can vary from 80% (curve K) to 50% (curve L) to 20% (curve M). 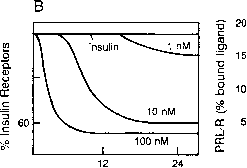 In B, homologous down-regulation of the insulin receptor is displayed; cultured lymphocytes were exposed to various concentrations of hormone, and total insulin receptor levels were determined. Gavin, J. R., Roth, J., Neville, D. M., De Meyts, P., and Buelle, D. N. (1974). Insulin-dependent regulation of insulin receptor concentration: A direct demonstration in cell culture. Proc. Natl. Acad. Sci. USA 71 (84-88). 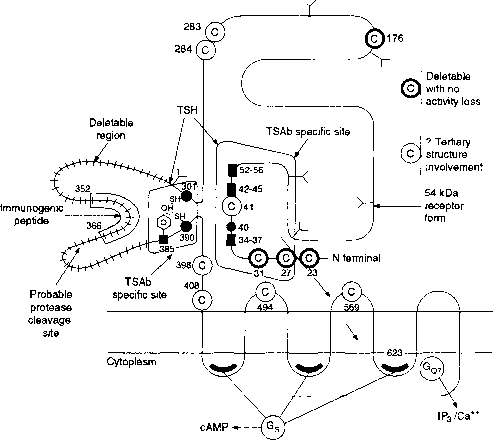 In C homologous up-regulation of the prolactin receptor (PRL) is displayed. Hypophysectomized rats were implanted with pituitaries under the kidney capsule. The increase of the hormone in serum preceded the increase of the receptor in liver. (Posner, B. I., Kelly, P. A., and Friesen, H. G. (1975). Prolactin receptors in rat liver: Possible induction by prolactin. Science 188, 57-59.